When two powerful and well-dressed women meet, you know you're in for a real treat. 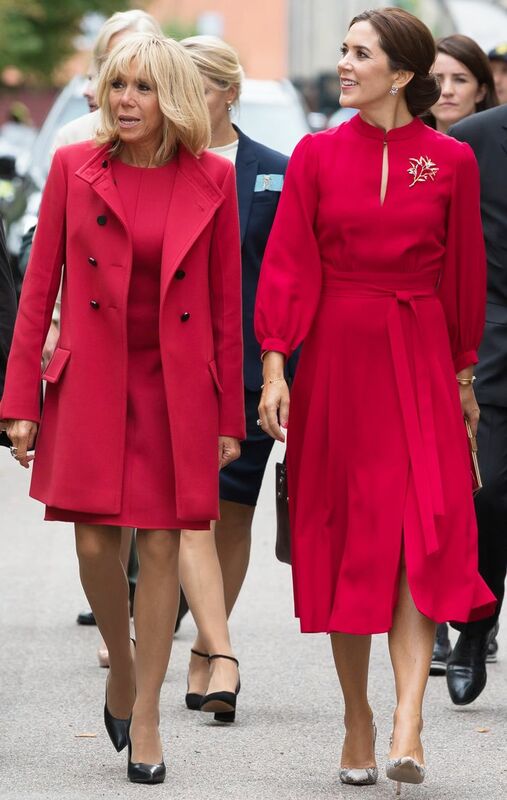 First Lady of France Brigitte Macron has landed in Copenhagen to meet with Princess Mary of Denmark, and the two showed up matching in one of our favorite fall trends: head-to-toe red. Since both women have an interest in fashion, it's not surprising that they also met with the CEO of the Global Fashion Agenda, which is dedicated to making fashion more sustainable. On its Instagram, the company explained that Macron and Princess Mary participated in a "roundtable talk at The Royal Danish Academy of Fine Arts, where they discussed sustainable solutions tackling the most prominent challenges the fashion industry faces." We can't wait to see how they'll bring their influence to the pressing problem. In the meantime, scroll down for photos from the duo's time in Copenhagen and to shop the red trend for yourself. Available in Italian sizes 34 to 46.